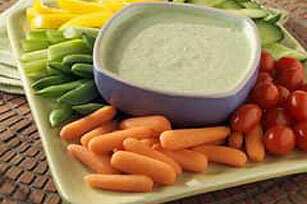 Pair our Garden Vegetable Dip with almost any cut-up vegetables. This Garden Vegetable Dip gets its veggie creds from spinach, green onions and cucumbers. Mix spinach, parsley, water, onions and tarragon in small saucepan. Bring to boil on medium-high heat. Reduce heat to low; cover. Simmer 1 min. ; drain. Place spinach mixture in blender or food processor. Add remaining ingredients; cover. Blend until smooth. Place in serving bowl; cover. Refrigerate several hours or overnight. Serve with assorted cut-up fresh vegetable dippers. Substitute dried basil leaves for the tarragon leaves.